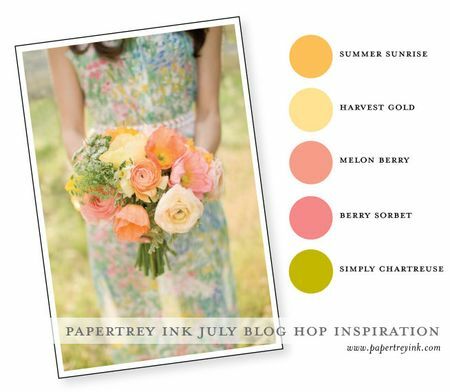 "This month's inspiration is all about pairing up beautiful summer colors as this wonderful season begins to come to a close". I think I managed to get all the colours in with this one tonight! Sorry about the poor photo - it's late here and the sun has gone down for the evening. I got the trusty Rosie Posie set out for the card and stamped in berry sorbet, summer sunrise, melon berry and chartreuse inks and the sentiment is from Simply You. Thanks for stopping by - enjoy the hop! This is GORGEOUS, Chris! I love the colors on your flowers, and your use of the Cane Print....the perfect touch! Such clever sentiment placement too!! Such a pretty card. Great job working in all the colors, I wasn't able to. Loving the textured background. Gorgeous card. Wonderful card! Love the layout. Beautiful card Chris, I love the embossing and you roses are fabulous. Oh, how pretty! Love the gorgeous flowers and that window cut. Just perfect. love the color, texture & layers - great card! Very pretty card! I always love a little shading on the Rosie Posie flowers! So pretty! I love how you used the negative of the Happy Day diecut and that fabulous texture! Love the subtle embossing on the yellow background. Such a pretty card. Happy crafting from across the globe! NIce card. Love how you did the sentiment. So pretty! Good job on the shading - I have to try that one of these days. Soooo pretty!! I love how you shaded the flowers and the texture in the background is fabulous! Gorgeous card Chris, praise from dawn too, loved seeing your photos from SAF- I'm from england too.